I don’t use Apple Pay because my iPhone’s fingerprint verification is so unreliable. 1. This guy is incompetent and should be fired (fairness seeking). 2. This guy is incompetent and will be fired anyway (realism). 3. This guy is incompetent and you should help him to acquire the skills he needs for his job (compassion). 4. Talk to your manager (practical). 5. It depends on the organization and culture (consultant speak). In general the correct answer is to address any concerns with your immediate manager, while being willing and able to offer suggestions should he/she request them. But both agreed that healthcare was ripe for disruption. That is still true, but the pace is slower than we envisioned a decade ago. One reason is the high cost of certification. Consumer-grade equipment produces interesting data for casual self-analysis. Producing data to be used in medical diagnoses requires greater confidence in the accuracy of the data and the consistency of the devices used to produce it. In the case of robotics, makers have to demonstrate in clinical trials that the equipment is safer and produces tangibly better outcomes. Another reason for the slow pace of disruption is maintaining the confidentiality of patient data. Device makers collect and store patient data, but need mechanisms authorize and interface with medical providers on behalf of the patients. Extending the value chain requires complex protocols and interfaces, while there is little incentive for any single party to develop them. These are some random musings on research I performed a few years ago. If I have overlooked any recent developments, please feel free to leave feedback. 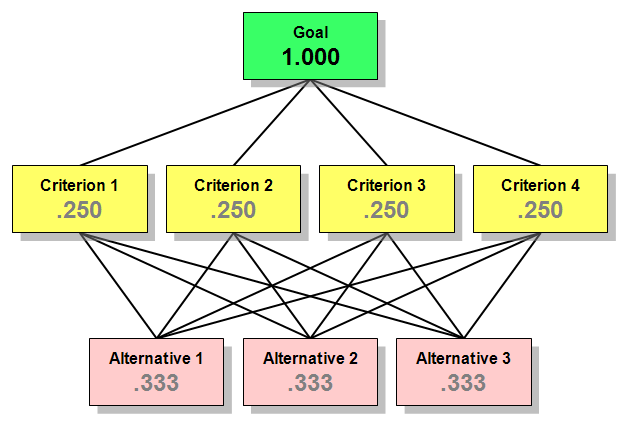 One model I want to explore today is the Analytic Hierarchy Process (AHP) that was developed by Thomas L. Saaty in the 1970’s as a tool for choosing an option using a set of weighted criteria. For example, we may choose a software package on the basis of criteria such as supported features or functions, scale-ability, quality (fitness for purpose, fitness for use), security, availability and disaster recovery. AHP provides a mechanism for weighting the criteria by interviewing several members of staff for one-by-one assessments of relative importance, which can then be transformed into relative weightings using an eigenvector transformation. The idea of using multiple criteria to assess multiple options is not new. AHP enhances the ability to weight the assessment criteria using feedback from multiple stakeholders with conflicting agendas. Rather than determining a “correct” answer it assesses the answer most consistent with the organization’s understanding of the problem. Other use cases can include project portfolio optimization, vendor selection, plant location, hiring, and risk assessment. More information can be found at the International Journal of the Analytic Hierarchy Process (free registration). In the field of ITSM there a examples of papers that describe the instances in which AHP was used. The paper “EDITOR-IN-CHIEF ENRIQUE MU USES AHP TO HELP CITY OF PITTSBURGH MOVE TO THE CLOUD” (free registration) briefly discusses Professor Enrique Mu’s application of the AHP for the City of Pittsburgh’s efforts to migrate IT functions to cloud providers. The decision period spanned several months and was considered strategic for the city. Another paper “The critical factors of success for information service industry in developing international market: Using analytic hierarchy process (AHP) approach” (paywall) discusses the use of AHP for analyzing critical success factors in international market diversification for information service providers in Taiwan. They interviewed 22 participants (CEO’s, experts, consultants) to generate pairwise comparisons of CSF’s, with which the AHP method was able to distill into factor weighting. These factor weightings could be used by specific information service providers to determine whether or not they should consider entering specific markets. In “A Method to Select IT Service Management Processes for Improvement” (free access to PDF) Professors from School of Management & Enterprise at University of Southern Queensland used AHP as part of a method for ranking ISO2000 process priorities for improvement. This particular paper is worth exploring in much greater detail because, in my experience, the prioritization or process or service improvement initiatives can be very painful at organizations, particularly those with multiple influential stakeholders with incompatible or conflicting requirements. IT organizations typically use simplified “rules of thumb” methods for prioritizing Incidents based on Impact and Urgency. Notably three of these four factors are typically included inside variants of the schema. Please see my discussion in Incident prioritization in detail (which also avoids the explicit use of SLAs in evaluating Incident resolution). I don’t find the prioritization of Incidents to be a particularly strong candidate for AHP analysis. High priority incidents are relatively rare and are generally handled one at a time or by non-overlapping resources. Lower priority incidents (routine break-fixes for Services Desk) can be handled first-come-first-service or using the relatively crude but quick methods described in ITIL. Prioritization of Problems seems a more suitable candidate for AHP because a) Problem resolution can require days or weeks, b) multiple Problems may be active and contending for resources, and c) the resolution or Problem can deliver much greater long-term financial impacts for organizations. The principles and underlying support system would be similar. For the time being I am focusing my attention on the use of models in service management (more here). Models are useful because they help us understand correlations, understand system dynamics, make predictions, and test the effects of changes. There are few, if any, models in regular use in service management. There may be valid reasons for this. There are few, if any, good models in regular use in business (there are many bad model, and many more that are fragile and not applicable outside narrow domains). ITIL1 2011 does make use of models, where appropriate. The service provider model is one such example that helps understand the nature of industry changes. The conditions in which these models can be applied haven’t been explored. It is time for us to explore other models that may be applicable and useful. Oh, and Happy New Year! I wish everyone a happy and prosperous 2017. 1 ITIL is a registered trademark of AXELOS. I don’t work with customers who implemented it successfully. I have nothing new to offer. Both points are still true. There isn’t anything new to say about DevOps except that the hype machine is still in overdrive and the loop machine is wearing out. DevOps is an improvement to Release and Deployment Management. There’s no conceptual abstraction on top that changes the way we think about releases and deployments. It arose in response to new layers of technical abstraction that enabled new capabilities. These include server virtualization (VMWare), the availability automated deployment tools (Chef, Puppet), and the rise of containers (Docker) and supporting programming interfaces and orchestration tools. Together they allow us to make an order of magnitude improvement in the performance of the Release and Deployment Management and Service Validation and Testing processes. This is a very good thing, because it drastically decreases the costs of software deployment, and enables more rapid experimentation when addressing new customers or improving existing customers. Moreover developers can do this with tools (programming languages) familiar to them. This is also a good thing. However, organizations adopting DevOps practices must understand the requirements of various stakeholders and minimize barriers of communication across silos: see Can We Stop Talking About DevOps?. Moreover, these organizations have to be in control of how applications are released (Release and Deployment Management), and you still have to know what you are automating (Service Asset and Configuration Management). People. Process. Technology. In that order. Nothing has changed. DevOps will fail without them, except in limited instances or for newly developed services (or recently deployed services) receiving abundant management attention and not encumbered by legacy configurations. In the long run the automated deployment of production environments has a bright future, as even more functions of IT are virtualized (networking, storage). In a sense, DevOps will have won; it will be pervasive. We just won’t call it DevOps any longer. We will go back to calling it Service Management. It’s just a hell of a lot harder than we are given credit for. Enter FiveThirtyEight Science on Science Isn’t Broken (“It’s just a hell of a lot harder than we give it credit for”). Science is messy by design. Scientific methods are adversarial. Scientists are competitive for mind share as well as funding. Science pushes into the unknown and forces us to recognize uncomfortable new truths. – Hamlet (1.2.254), Hamlet, alone on the platform. Interest in ITIL® certifications is flat, and declining in most regions except Europe and Asia, the latter primarily meaning India. ITIL is largely irrelevant in the rest of the world, or rapidly becoming so. None of the frameworks built in parallel with ITIL®, including IEC/ISO 20000 and COBIT5, have made any traction. Best practices and good practices are, by definition, past practices. The framework is ineffective in complex environments in which cause and effect relationships are obvious only in retrospect, and in which emergent behaviors are unpredictable. The ITIL® framework, itself long in the tooth, was last updated in 2011 with no refresh in sight. AXELOS and ISACA have increasingly turned their attention to information security with their RESILIA™ framework and Cybersecurity Nexus portal, respectively. This is a natural extension for ISACA and a slight departure for AXELOS. IT is so hard in part because it is complex. In a few short years the industry has transitioned from traditional servers, to virtual servers and increasingly to containers. Container orchestration is improving just as hybrid containers and hyperconverged infrastructure standards are appearing. IT services are increasingly delivered via a combination of in-house and cloud vendors, each of which operates with different standards and API’s. Meanwhile, security attacks are becoming increasingly sophisticated as the attackers become professionals. What will emerge in two years is anyone’s guess. If your head isn’t spinning, you aren’t paying attention. IT departments are paying attention, even if they do not have the tools for managing it. What they don’t need is 4 more processes in the next revision of ITIL® or more control points in COBIT5. One thing we do need is a framework for managing complexity. The Cynefin Framework shows promise for helping to manage the trade-offs between discovering emergent behaviors and exploiting them. Cynefin is not a panacea, but once the nature of complexity is understood, it follows that panaceas only exist in ancient mythologies. IT departments, meanwhile, will continue muddling along, hobbled but not broken. In this post I elaborate on and refine the above definitions. In addition I propose two new Change Types: Escalated and Latent. In the diagram above we see the emphasis and utility of the Change Types across two axes: the source of the Change (external vs. internal), and the level of risk to the service provider and users of the service. The ultimate source of a change can vary widely. External sources include regulators, vendors, partners, customers, who may request specific functions or who may make changes that affect the service provider. Internal sources include Incidents, component upgrades, and code refactoring. Some where in the middle of these are patches, COTS software upgrades, etc. We would see a similar diagram if we replaced source with urgency. Assessing the risk of a Change is another discussion. I also ignore the broader definitions of what are Changes. These definitions are organizationally-specific and are the subject of a later post. Normal is the default mode for Changes. Unless otherwise specified, Changes are Normal. Normal Change is also the place to start when defining or improving the Change Management process. Other Change types are variations of the Normal Change process. Sometimes Incident resolutions requires a Change. This may include restarting a component of a service, applying a patch or update, or modifying configuration files. In order to facilitate prompt resolution of Incidents, we define an Emergency Change process that is faster than that of Normal Changes. Emergency Changes are created in order to resolve an Incident. The Emergency Change record should be linked to the Incident record. Emergency Changes are distinct from Escalated Changes, which are not created in response to an active Incident. There is no standard Emergency Change process. The authorization of Emergency Changes will be different in each organization, but it should be faster and simpler than the Normal Change authorization. Emergency Change authorization may require only the approval of the functional supervisor or manager, the service owner, or even a peer review of another team member. The pool of eligible approvers should be flexible. Emergencies sometimes occur in the middle of the night or on a weekend, when staff availability is limited. The Emergency Change approvals may also be transmitted verbally. In this case the Emergency Change record may not even exist until after it is approved and implemented. The Change should always be recorded after the fact, typically when the Incident record is updated, and should include who gave the approval. Emergency Changes that are verbally approved may be treated as a Normal Change after the fact, in order to reflect on what occurred, whether the actions were appropriate, and whether any follow up actions are required in order to monitor, modify, or roll back the Emergency Change. In order to avoid clogging up the Normal Change management queue with high-volume, low-risk, organizations may pre-approve specific classes of Changes that may be implemented, at will, within the constraints specified by the approval. Such Changes are called Standard Changes. Constraints on Standard Changes may include limitations on the scope of the Change, the specific system services on which the Change may or may not be implemented, or time-based windows for the Changes, to name just a few. A specific class of a Standard Change should be approved as a Normal Change. Thereafter it may be implemented as required, with only logging of the Change. In the ITSM tool this may be implemented as a “Quick Template” in order to pre-fill much or most of the Change record data. Organizations may refer to Standard Changes as Preapproved Changes, in order to eliminate ambiguities between the terms “Standard” and “Normal”. A Change that must be approved or implemented outside of the Normal Change process or window, but is not an Emergency Change, is an Escalated Change. A typical example is an Escalated Change is one that is identified on Thursday and must be implemented the following day, Friday, prior to next CAB meeting. Internal organizational or political changes. The Escalated Change approval process may be the same as that for an Emergency Change, or it may be a variation of either the Emergency Change or Normal Changes approval process. Because the preponderance of Escalated Changes frequently reduces the overall efficiency of an organization’s Change and Release Management processes and incur a higher number of Incidents, it is important to track and log them separately from other Change Types. Frequently organizations will do so in order to discourage their excessive or unnecessary use. Latent Changes are Changes to Services or components that were or will be implemented without any action by the service provider, but which may impact the Services of the provider. The Latent Change type is growing in importance along with the increased reliance on Software as a Service and managed service providers. These providers may make changes to their applications or infrastructure that affect multiple customers. An individual customer may record such a Change as a Latent Change. A Latent Change may also result from an automated action, such as a patch applied by an ITAM system, or a server restart initiated by an Event Monitoring system. Finally, a Latent Change may also be an unauthorized Change detected automatically by an ITAM system or manually by a system administrator. In all cases the Latent Change is recorded and examined, but is not approved. A Latent Change may result in another Change that will roll back, repair, or replace the Latent Change. It is important to log Latent Changes because they happen, and because they affect Services. Wow, 2016 is upon us already. Sadly, 2015 passed me by without a single post on ITSMinfo. To some extent I was just busy. As an independent consultant I am paid by the hour and I have to watch billable hours closely. Fortunately, I stayed busy in 2015. I also exercised regularly, running and lifting weights at the gym. I also slept regularly, as much as possible, given my global coverage (living in Japan working North American hours). To some some extent my lack of productivity on the ITSMinfo blog was simple laziness and poor time management. I didn’t track blog ideas as they came to me. I didn’t follow up on ideas I already had. I am resolved to fix them this year. I do expect to increase output on the ITSMinfo blog to at least monthly. I want posts that are useful to the practitioner community. I will follow recent trends and updates from practitioners, consultants, and academics. I hope to contribute new ideas to the ITSM community. I have updated my WordPress theme to the latest refresh. Content dumbed down to the fifth grade level. I assume that people in this community are smart. If we want to move this industry forward, we must have frank, adult discussions. How to implement XYZ process in 5 simple steps. Personal rants or ravings on non-IT topics. You can also find personal rants on my 2G16 blog. As always I want this blog to be part of a conversation. Sometimes I am wrong. Okay, more than sometimes. I am happy to be corrected, even insulted. This conversation will extend into related forums on Twitter, LinkedIn, Facebook, and Google Plus. On this blog I have updated the commenting system to use Disqus, which I hope will simplify usage.